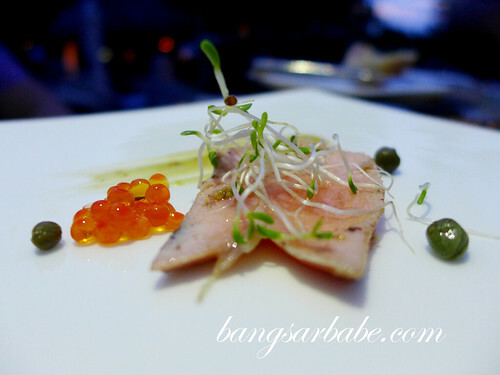 At The Datai Langkawi, rif and I enjoyed a delicious 5-course dinner at Beach Club Restaurant with a gorgeous view of the Andaman sea. That’s the beauty of dining al-fresco at The Beach Club, where the restaurant is adjacent to the beachfront and pool. 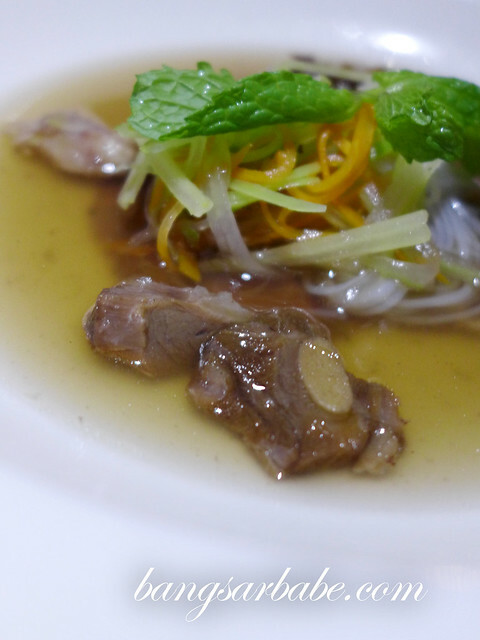 Dinner started with the Oxtail Bullion, a stew of tender beef and glass noodle. Despite its somewhat light appearance, it was richly flavoured with a crisp finish from the onions. 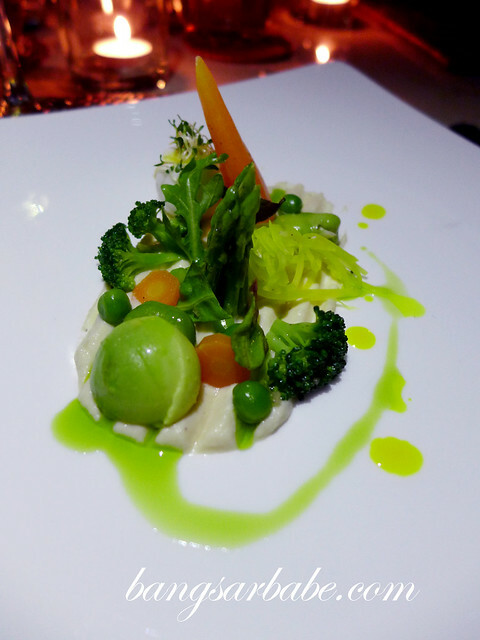 I liked the presentation of the Meli-Melo – their version of garden vegetable salad. 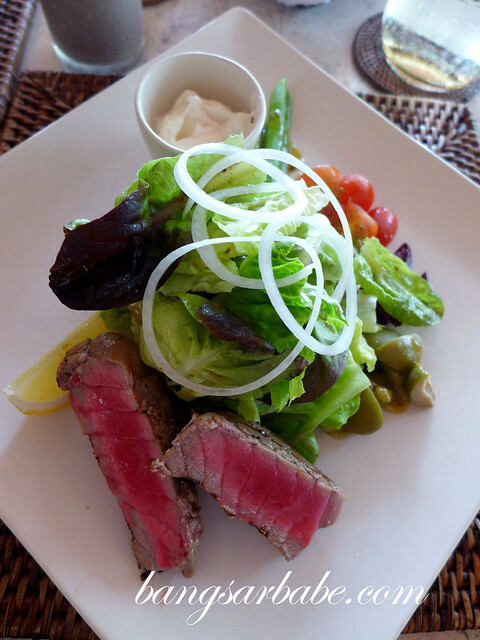 If I had to choose one dish at The Beach Club, it’s the Tuna Niçoise. This came atop a bed of kalamata olives, cherry tomatoes and roasted potatoes. 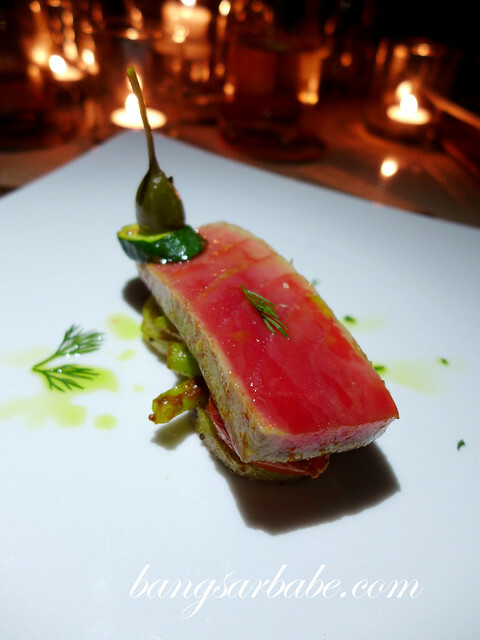 They do tuna so good here – even the ahi tuna salad I had for lunch the following day was equally stellar. 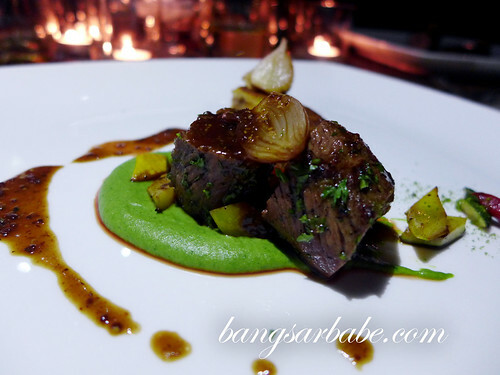 The Herb Grilled Lamb Loin with Green Peas Mousse, Eggplant Parmigiana and Pommery Mustard Jus was well seasoned and meltingly tender. Great combination, and the mustard gave it a mild kick. 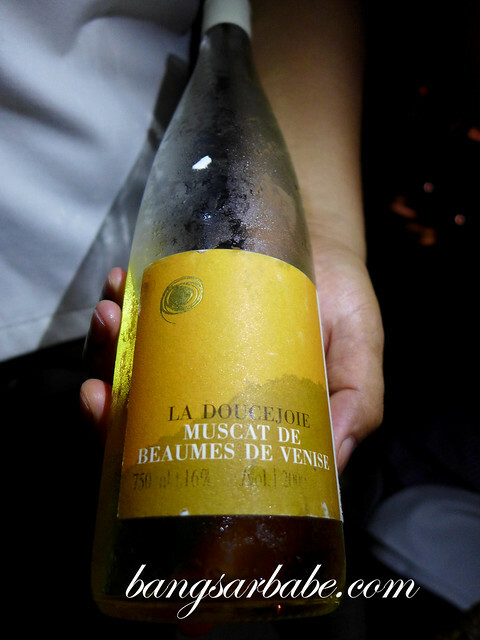 Dessert was the Lemon Tart with Basil Crumble and Blueberry Compote – paired with a glass of Muscat de Beaumes de Venise , a fortified sweet wine that was full bodied with a lemon finish. Very nice with the tart, but I found the pastry base a tad hard. For lunch the next day, I had the ahi tuna salad and the seafood noodles — both delicious. The seafood was fresh and springy (notably the prawns and squid), while the egg noodles were crispy and well flavoured by the gravy. 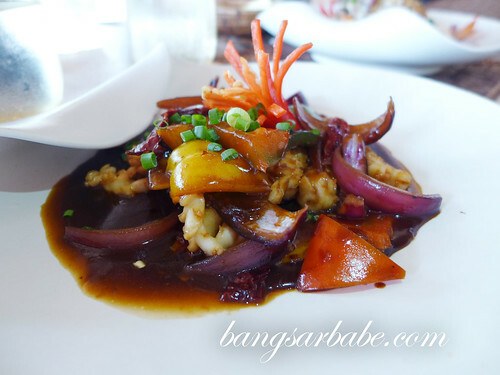 rif’s stir-fried squid was outshone by my noodles, but the squid slices were tender and generous in portion. 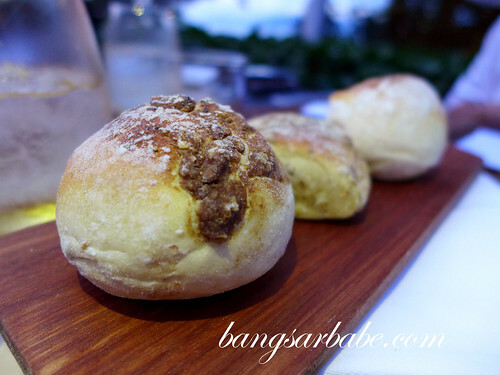 Like The Gulai House, I’m impressed with my meals at Beach Club Restaurant. 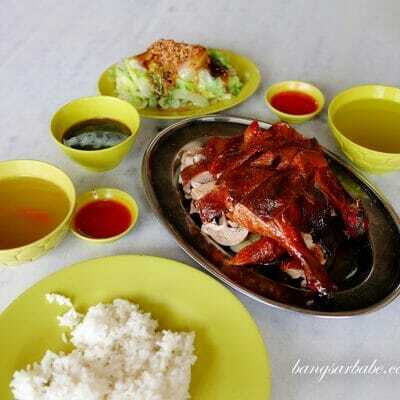 Service was warm and the food was consistently good. For more information about The Beach Club, visit The Datai Langkawi’s official website here. Also, “Like” The Datai Langkawi on Facebook. 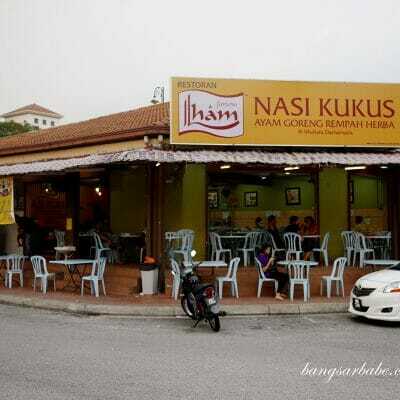 Verdict: Good food and friendly service. Try the ahi tuna salad!